PCW-S1606-ARAB-SASANIAN. Umayyad Caliphate. temp. Hisham ibn 'Abd al-Malik. AH 105-125 / AD 724-743. Æ Pashiz (2.66 gm; 16mm x 18mm). Arab-Sasanian type. Tabaristan mint. Dated PYE 89 in Pahlavi = AH 123 (AD 740/1). Crowned Sasanian-style bust right; GDH monogram in Pahlavi to left, 'pzwt' Pahlavi to right / Date and mint in Pahlavi in two lines; Triple pellets above and below; stars flanking. 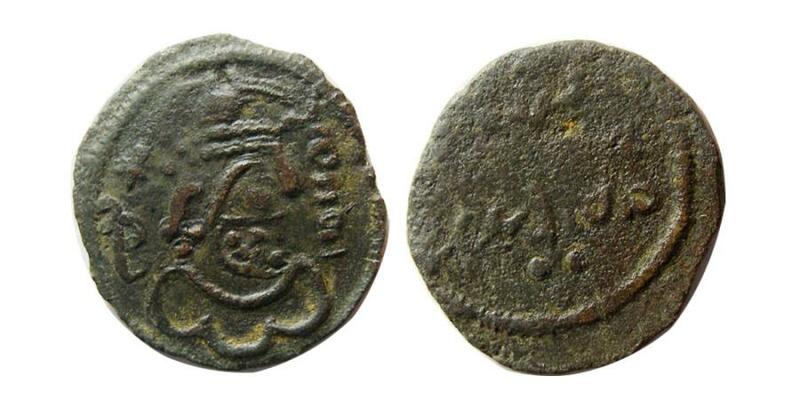 SICA I –; Geyselen Type 47a; Walker, Arab-Sasanian –; Album 48.2; ICV –. Nice brown-reddish patina. Choice VF. SASANIAN KINGS. Shapur II. AD. 309-379. Silver Drachm. Rare. From The Sunrise Collection. SASANIAN KINGS. Bahram V. 420-438 AD. Silver Drachm. AW mint. Choice FDC. Rare. TABIRSTAN. Khourshid II. Ca. 8th. Century AD. AR hemidrachm. Year 60. Choice FDC. Lustrous. SASANIAN KINGS. Shahpur II. AD. 309-379. Silver Drachm. Choice Superb "As Struck".